It’s impossible not to be impressed by the incredible strides Pip Blom has taken over the course of just two years. What started as a bunch of perfunctory home recordings has flourished into a full-fledged powerhouse of a band. By the time this interview – conducted back in March – is published, Blom will have achieved many of the goals she weighed in on in this here Q&A; she has since performed with heavyweights like The Breeders, Franz Ferdinand, and Garbage, and as of this moment, is in the process of recording new music with renowned producer Dave McCracken. The Amsterdam-based Blom is a naturally gifted tunesmith, who can evoke maximum depth and spirit with a bare minimum of language. Even amidst a relentless cycle of touring and recording, she seems acutely aware of spearheading a rapidly amalgamating Dutch scene, one that seems to spawn new interesting bands at a ridiculous pace. Amidst this vibrant explosion of creativity, Pip appears to be soaking it all up like a sponge, adding new elements to her well-established winsome songcraft. I once spotted her and Canshaker Pi-frontman Willem Smit attending a gig in supposed rival city Rotterdam, featuring a line-up of It Dockumer Lokaeltsje, The Homesick, and The Ex. By presenting themselves as a full band – Pip (vocals/guitars) her brother Tender (vocals/guitars), Darek Mercks (bass) and Gini Cameron (skins) – Pip Blom now embrace a more collaborative writing dynamic, and it has elevated the band’s sound considerably. Anchored by Pip’s shrewd songwriting chops, upcoming 10-inch EP Paycheck paints a broader sonic canvas than ever, with more atmospheric elements to home in on. Like the bizarro twin of Cat Power’s ‘Cross Bones Style’, the knotty ‘Come Home’ teeters in anxiety with haunting vocal hooks, mediating a no-frills, detached coolness and laser-focused aplomb. DiS: Have you made plans for the entire year, or are you aiming to just play shows and hang loose for a bit? 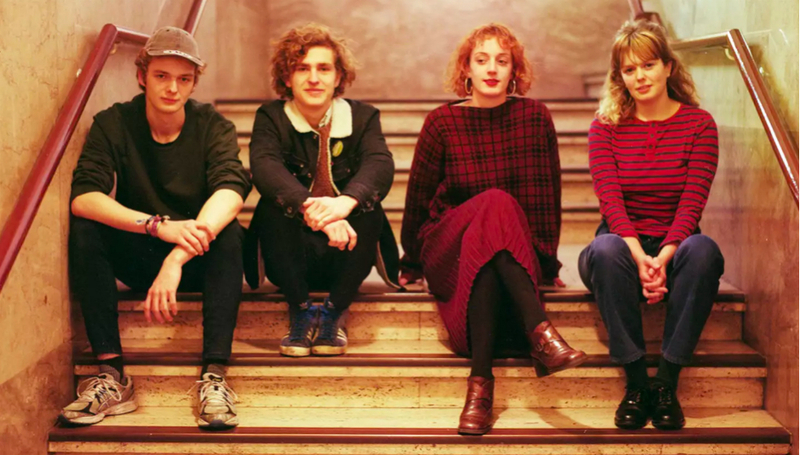 Pip Blom: [Being in a band] is never just ‘hanging loose’. I really enjoy every aspect of playing and performing, but it’s important to set specific goals in advance – what it is you want to accomplish, to make a plan that sort of dovetails with that. Per definition, you don’t have to realize that particular goal. But I’m a big advocate for at least working towards it. I don’t believe in just basking in it all; if you do that, the chance of accomplishing your goal will become significantly smaller. The goal for 2018 was to gain more recognition in the UK (check), but mostly, to become a really tight live band (check). We played a lot of shows. One of our initial pitfalls was – even before Pip Blom became a band – the songs I recorded on my own gained traction online, which meant that once the shows started to come – people had a certain idea planted in their head of what it was going to sound like. But at the time, we hadn’t really played together at all. So already, we had to live up to something we weren’t a hundred per cent acquainted with. That’s why the past year was so chill, because we just played so many shows. We tried out different line-ups, but this group of people has given us the biggest comfort zone. Now we’ve come to a point where we can be really tight. The idea of living up to something, is that a pressure you felt from the outside, or more from within? Definitely from within. That’s the entire reason I’m doing this: I’m having a great time. There are instances when people would come up to us to tell us: "Don’t play this song at a live show". But I’m not interested in that. Pip Blom revolves very much around the four of us, and whether we get sufficient enjoyment and energy out of doing this. Any way you slice it, we don’t exactly earn a living from this. Well, we sort of do, but those earnings are spent immediately on the band again. That means all for of us invest a lot of time in Pip Blom. Once it starts to feel like a chore, then it’s ripe for expiration. But again, by any means, the main priority is: "Are we having fun? How do we feel about it? Are we enjoying each other’s company?" Have some songs changed in the midst of playing them live a gazillion times? Well, never drastically, more like in the smaller details, like intro’s or interludes. We have been working with Dave McCracken [who's worked with Beyoncé, Ian Brown, Florence & The Machine, dEUS], and we’ve recorded four songs with him. We’ve taken some very different approaches with these tracks. And now, with the five of us in the mix, each song gets a life of its own. The thing is: people always like to portray bands as this carefree clique of friends who are always hanging out. But there’s something pretty scary about it. You are putting yourself out there creatively, and you are constantly doing something people can immediately comment on. That can sometimes be a little unnerving, as people can act dismissive towards something you’re passionate about yourself. But once you’ve assembled the right people around you, it really eases up many things. Huge. But when you perform live, it’s always a different thing; you can communicate a lot with just the level of energy you summon. But in a recording, that energy isn’t always there. So next to writing a good song, developing a distinctive sound is really crucial. So I definitely sink my teeth in that. With Dave, I usually demo my songs, and then we cherry pick the elements what we both like – for example, a certain guitar flourish or bass line. And then we try to reconfigure those elements into something different. The song recording ends up becoming a bit of a collage of my own arrangements. Dave often tells me that, sometimes, you can’t improve on certain parts of the demo, so why not just reuse them? I happen to agree with that approach, it’s a super fun way to work! I think you’ve really shown remarkable poise and patience in your output the past two years; sporadically, you put out a couple of EPs to hone your sound thoroughly. A lot of bands in your position would’ve probably rushed out an album by now, even if it’s to capitalize on all the buzz. It kind of makes me wonder how you envision your idea of a full-length album. Yeah, I don’t have as much attachment to ‘the album’ as most people. But really, when I started writing music I wasn’t remotely at the stage where I wanted to be in terms of creativity. So I never held any false illusions there. It’s kind of nuts to start releasing ten-to-twelve songs at once so prematurely. That’s the main reason why I never felt it was the right time, and I think Pip Blom still has plenty of upside to discover new things. To the point where we can make music that we can look back on ten years from now and say: I’m a hundred per cent happy and proud of how this record turned out! Your songs kind of home in on simple ideas that resonate immediately. Which, in turn, allow you to be very sly and deceptive. But once you make that first record, there’s this dilemma: am I going to showcase that bare essence of what I do really well, or make something a bit more sprawling and risky? So far, we’ve released singles and EPs pretty much exclusively. And I am personally very fond of all those songs. But there will always be songs in stock that won’t be single material per se, songs I’ve grown attached to. The idea is to not go on a linear route, with everything resonating on just that basic level, as far as loudness and dynamics. But who knows? There is still a lot to explore, in terms of rehearsing and developing the songs. Maybe we’re going to end up with only bangers! But it could also become very experimental. Either way, I don’t really care much about what the outside world thinks or expects. Your early recordings naturally had very intimate introspective feel to them, whereas a song like ‘Taxi Driver’ confidently creates this fun narrative about a specific, more fleeting moment. Is that’s something you take a lot of liberty in, creating a distance between your own reality and what you wish to express? Yeah, absolutely. It’s kind of a jumble! I always write my lyrics last. It starts as a bit of gibberish, sentences that don’t really mean anything specific. It’s more a way to pinpoint what kind of tones fit well with the melody. From there I usually pick two words that I feel have to make it in. The lyrics I write can relate to me personally, but that’s not necessarily by default. I watch a lot of documentaries and read a lot of books. I do have to stress that I’m not keen on really explaining what my lyrics mean. I enjoy it when people let their own imagination dictate that. You’ve been holding a job amidst all the touring (during the time this interview was conducted, ed.). How have you balanced those two things? Well, it would be nice if music earns enough dough to take away the pressure of being so busy all the time. Because you’re away for a good chunk of the year, and once you come home, you have to work immediately. That consumes a lot of time and energy from writing new songs, and moments to just relax. It would be nice to have that luxury one day. Until then, I think we’re in good shape. We’ve started this band because we simply love doing this. As long as it remains as fun as it has been so far, it doesn’t feel like a burden to us. But it’s an important thing to keep monitoring that, so that the fatigue doesn’t set in. Well put. A lot of musicians, even from an older generation, often have to hold a side gig to survive. Plus, it’s very important to find yourself in a different milieu than just the music business from time to time. When I’m in the kitchen doing the dishes, it doesn’t matter to anyone that I’ve opened up for Franz Ferdinand, in front of 2000 fans, the night before. Then the main objective is to get these plates clean and shiny. I think it’s very important to surround yourself with people who stem from a different branch, just to keep life grounded. I mean, I’m not the type of person that allows things to get to her head easily anyway. Music isn’t everything. For me, it happens to take up a lot of time and joy. But it can be just as satisfying seeing hundreds of hamburgers being prepared every single night! That’s the thing that bothers me about the music business sometimes. It’s as if you’re not allowed to pat yourself on the back and say ‘I’m actually doing good by myself on my terms’. It will immediately come across as hubris. I agree, but I will never say that about myself. It doesn’t feel like that: it’s more like some sort of fluke. And sure, I’m well aware that I invest a lot of time in my music and reflect on it. But at the same time, it feels like it could cease to be at any moment. I understand that showing a bit of swagger isn’t per se bad, but I realize that when things go wrong, you end up falling harder. So I’m constantly replaying in my head: this could be over in two months. But your earlier remark about doing the dishes does hit home. It can be applied for any type of job: taking one small step at a time, focus on the task at hand. I reckon it’s healthy these days, with all of the distractions looming, to compartmentalize things as an artist. Looking at the big picture can be maddening, I suppose. That’s why – as long as I’m making music with Pip Blom and enjoying myself – I couldn’t take a job that forces me to still think about music outside of the band activities. That’s a bit too much. Your blog on how streaming helped spread your music’s exposure was very insightful. From an outsider’s perspective, you seem to be very proactive in grasping the industry’s inner workings. The weird thing is, that’s what you would think. The initial idea was to write and record one song each week in the month of February 2016. My dad [Erwin Blom, music/tech journalist and one of the founders of punk/electronic outfit Eton Crop, ed.] tweeted about the first song I released (‘Hours’), and suddenly quite a few people – in both my own inner circle and my dad’s – started sharing and commenting as well. It was around the same time Spotify published the playlist Fresh Finds. And of course, these playlists draw heavily on traffic and algorithms, and that’s how it got such a nice push. Once that happened, we realized "Whoa, it actually works far more transparently than you’d think." That being said, a lot of things surrounding the access to Spotify are still a big mystery for me. I notice a strong discord on this topic between bands in The Netherlands and, say, American bands. I’ve interviewed plenty of American and UK bands who feel duped by Spotify, a million dollar company, basically feeding them scraps, especially when equating this to the company’s salary wages. They feel their music is the real product, not the streaming service. But over here bands seem to generally be more positive about the exposure streaming services can potentially give their work, even while resigning themselves to the notion that it doesn’t elicit much financial reward. I don’t know any musician who has made a profit from music copyright. Bands who are friends of ours, like Canshaker Pi and Mozes and The Firstborn, all put their earnings back into the band, just like us. That’s quite comforting in a way, to understand from the outset that you won’t see any of it on your own bank account. But I understand why people get sour about not being able to make a living from music. I always keep it in the back of my head: all of this once started as a hobby anyway. And now, because I’m doing this, I get to see places I would have never gotten to visit otherwise, meet people I would have otherwise never met. It’s just a different type of payoff. I would hope that at a certain point, the payoff is sufficient enough to kind of keep it healthy and creatively viable. I guess it’s always the toughest when you start at the very bottom of the ladder. I’ve witnessed a lot of bands hang it up in those tenuous early stages. You kind of have to be chronically stubborn. I think that for a lot of Dutch artists – even though now it appears to really change – it was customary to first build your following in The Netherlands, and then try their luck abroad. But when you do the exact opposite, when you go the UK – relatively speaking – you start off even lower down the ladder. You don’t get any riders, no hospitality, often-times you have to make do with just one stage monitor. I can understand that this switch can be a bit tough to swallow. It’s completely different than what you would otherwise anticipate. That’s a very good point. People underestimate that the Dutch music infrastructure is, relatively speaking, very organized and well facilitated. It’s a rude awakening when you’re tossed into the deep end like that, across the pond. But a band like Pip Blom, which thrives very much on raw energy, can lean on more modest means. That’s a more flexible situation. But I guess it also depends what type of band you want to be. Understandably, plenty of bands only work well live within a specific setting. I do notice a lot more Dutch bands just taking that leap of faith. There are a couple of factors at play here: it’s true that more and more Dutch artists are getting noticed in the UK and the US. And, for an extended period of time, this simply wasn’t the case. Once it started to happen again, it suddenly became this very realistic and attainable ambition. That’s why more bands are like ‘let’s give it a shot, who knows?’ I really hope it’s going to happen more and more. Paycheck is out now via Persona Non Grata and Nice Swan Records. For more information about Pip Blom, please click here.